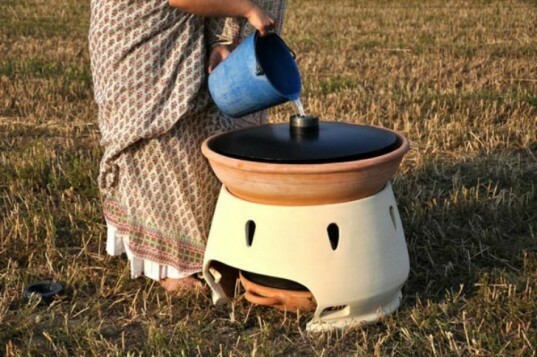 Eliodomestico is a solar-powered water filter that can be made from simple and readily available materials and is capable of purifying 5 liters of water each day. Developed by Italian designer Gabriele Diamanti, the water filter is essentially a solar still that boils water and separates it from other elements and delivers clean and pure drinking water. Made from terracotta, anodized zinc, and recycled plastic, Eliodomestico operates without filters or electricity, and requires minimal maintenance. The open source design was recently named as one of 12 finalists in the Prix Émile Hermès 2011 competition. Diamanti’s solar powered water filter is designed to provide drinking water for families in developing countries. Eliodomestico is a solar still that operates a bit like an upside-down coffee maker. At the beginning of the day, water is poured into the terracotta chamber. As the day begins the still heats up and eventually gets hot enough to boil the water, creating steam. The steam forced into the expansion nozzle at the top and then condenses against the lid, where it then drips down into the catch basin below. At the end of the day, assuming it was hot enough outside, there will be 5 liters of fresh drinking water available. The solar-powered filter can function without fuel, electricity, filters, and it requires no maintenance. These devices can also be built anywhere from readily available materials – anyone who can throw a pot can handcraft the main elements necessary for the water filter. Diamanti estimates that a normal solar still costs around $100 dollars and only produces about 3 liters a day, while his Eliodomestico could be made for $50 and produce 5 liters. The design is available as an open-source project for anyone who wants to make one and is licensed under a CC Attribution-NonCommercial-ShareAlike 2.0 Generic License. Good. How can I get a sample? This project is so much interesting. It contributes to relieve several people's lives. I would like to ask if this project can be tested in filtering also ordinary river water. Because in my country people still use river or lake water to drink. I find it very difficult to believe that a device with such a small exposure area (to sun) can produce 5 litres a day. From the pictures, the area seem to be about 0.12 sqm. At the typical tropical solar radiation levels (1000 watts/sqm), the solar power falling within this area will be about 120 watts. Because of heat losses the net power gained will be much less than this. Even if we target an ambition 50% at temperatures needed for boiling the power comes down to 60 Watts. An Australian device recently marketed has a total exposure area of about 3 sqm and it produces about 20 litres of distilled water in a whole day. Therefore, 5 litres expected from 24 times less area seems to be superambitious. Is there any scientific publication which shows real data from this device? Where can I buy an Eliodomestico solar water distiller? I would like to make my own Eliodomestico solar household distiller. How do I get the plans? 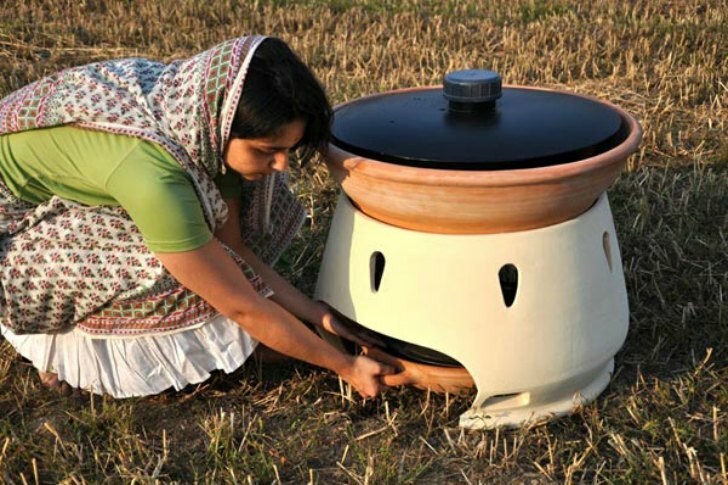 Where can you buy the solar water filter? Wow this is awesome! How does one make it? hey dis project is d best 1, i liked it.. can u mail me more details about this topic on my email id, i want learn more about it.. thanks.. I would love to buy the Eliodomestico to show my friends as we live 35mile off the coast of Texas and we have have had a few Hurricanes.I dont like being without water found this out the hard way during Ike. Diamanti's solar powered water filter is designed to provide drinking water for families in developing countries. Eliodomestico is a solar still that operates a bit like an upside-down coffee maker. At the beginning of the day, water is poured into the terracotta chamber. As the day begins the still heats up and eventually gets hot enough to boil the water, creating steam. The steam forced into the expansion nozzle at the top and then condenses against the lid, where it then drips down into the catch basin below. At the end of the day, assuming it was hot enough outside, there will be 5 liters of fresh drinking water available. The solar-powered filter can function without fuel, electricity, filters, and it requires no maintenance. These devices can be built anywhere from readily available materials. Anyone who can throw a pot can handcraft the main elements necessary for the water filter. Water is heated to produce steam, which condenses into potable water that drips down into the basin. The basin is designed to be a familiar size and shape. Diamanti estimates that a normal solar still costs around $100 dollars and only produces about 3 liters a day, while his Eliodomestico could be made for $50 and produce 5 liters.